London: After riding the best first quarter in at least a decade across assets including stocks, credit and crude, a growing chorus of investors has a new mantra: Don’t look down. It’s in bunds that are bought at any price — even when you lose money by holding them. It was in the inverted US yield curve and subsequent blast of market volatility, and the deluge of hand-wringing that followed. The flight from exchange-traded stocks sensitive to cyclical downturns. The under-positioning across major assets — including among the year’s biggest winners. 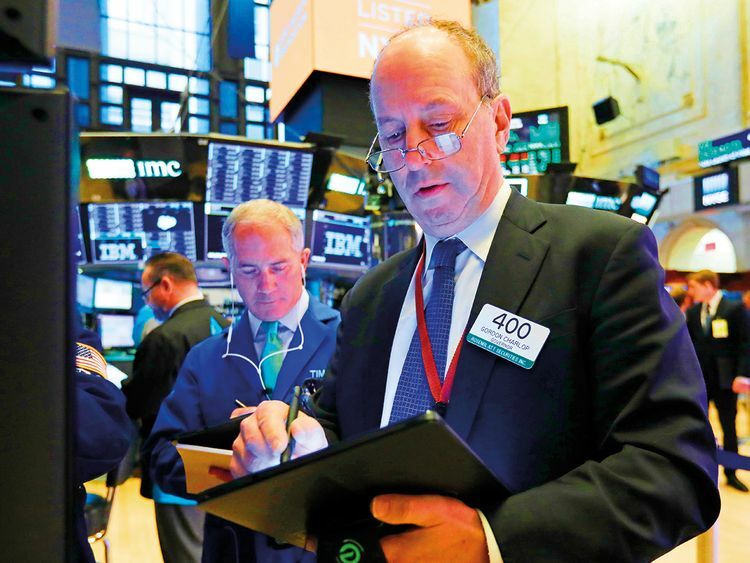 Add up all the green and the nervousness makes sense: A rebound of 13 per cent in the S&P 500 Index, a jump of 7 per cent in US junk bonds and an eye-watering 32 per cent surge for oil are among the standout statistics. These kind of gains, at this kind of pace, by their nature sow the seeds of instability and doubt. For Pacific Investment Management Co., the rally in risk assets has gone too far. The $1.7 trillion fund manager is now “slightly underweight corporate credit” and “cautious” on equities, according to global economic adviser Joachim Fels. A glance at the bond market offers more reasons for caution. This was the quarter in which the Federal Reserve and other policymakers around the world veered away from tightening, forcing investors to rethink the outlook for economic growth and inflation. In the ensuing rush to the safety of government debt, the 10-year and three-month Treasuries spread turned negative for the first time since 2007 — in doing so generating even more angst about growth. Yet the accommodative stance of central bankers is also a primary catalyst for the cross-asset gains in 2019. Policymakers have shown they’re ready to rush to the aid of markets, and that in itself is a reason for many investors to ignore their misgivings and keep buying. Federal Reserve officials slashed their projected interest-rate increases this year to zero from two, while the European Central Bank extended its pledge on record-low rates. Policymakers in China are doling out fiscal and monetary stimulus to revive growth laid low by trade tensions with the US. There’s a lot of dry powder. Total assets in money market funds remains at about $3 trillion (Dh11 trillion), according to data compiled by Bloomberg. That’s near the highest since 2010, even though the yield on one-month Treasury bills appears to be topping out. A revival in the country is at the heart of the investment strategy favoured by Christophe Donay, head of asset allocation and macro research at Pictet Wealth Management. He expects both a détente in trade tensions and the effects of stimulus to percolate through the world’s second-biggest economy, and is selling bonds even as they rally in favour of riskier, illiquid assets. It’s muting enthusiasm for equities. Even as a gauge of global stocks posted the best quarter in seven years, investors pulled $79 billion from equity funds, according to Bank of America. An MSCI index of so-called quality companies — those with strong balance sheets — has gained more than 14 per cent this year, versus about 9 per cent for those with a weaker financial profile. That kind of investor caution stands out in particular, because the moves across credit markets this quarter have looked pretty favourable for any companies carrying debt. Borrowing costs seem to be falling across the board, even for junk-rated issuers. US high-yield corporate bonds have enjoyed one of their best first-quarters in at least two decades. It’s all enough to sideline money managers like Ricardo Gil, who helps oversee 4.6 billion euros (Dh19/10 billion; $5.2 billion) at Trea Asset Management in Madrid.